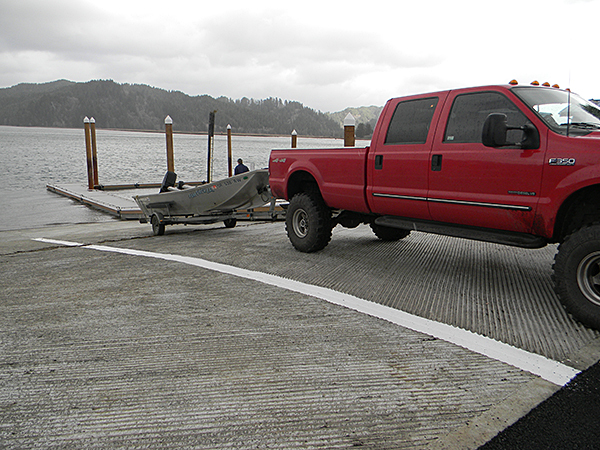 REEDSPORT, Ore. – Boaters and anglers now have improved access to the lower Umpqua River in Reedsport, now that the Rainbow Plaza boat ramp is complete. Rainbow Plaza is a popular and heavily used boat launch facility with an estimated 10,000 boat launches per year. This project was needed as the facility had not had major improvements since the early ‘90s. As part of this project, a new piece of land was purchased and an old building removed, along with expanding the parking lot at the site. Old derelict pilings were removed and the boat launch was widened to improve navigability and congestion. Additionally, a new ADA flush restroom was installed, debris deflectors and boarding docks were installed, and parking lot was reconfigured with new curbs, islands, sidewalks and a storm water treatment system. 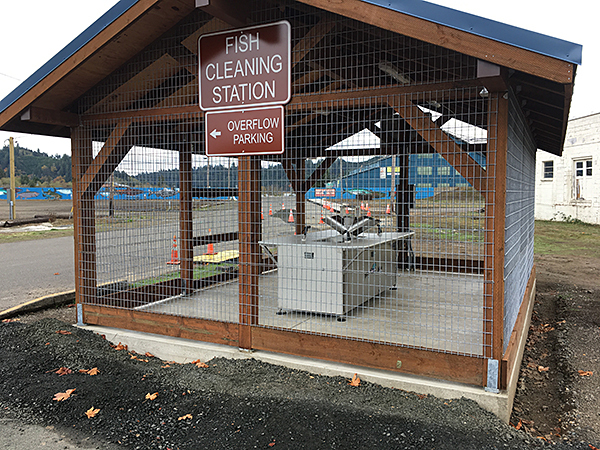 A new fish cleaning station with grinder was also added across the street from the facility on City-owned property adjacent to the overflow gravel parking along with boat wash-down station. According to ODFW STEP Biologist Evan Leonetti, this site provides improved boating access to a great angling opportunity for fall Chinook, coho, surf perch and sturgeon, all within a mile or two from the ramp This project added a new fish cleaning station right at Rainbow Plaza, when previously anglers had to drive down to Salmon Harbor to the nearest fish cleaning station. The facility is attractive to boat anglers, because it offers a two-lane boat ramp with lots of boarding docks and 36 vehicle with boat trailer and 11 single car parking spots; all factors that reduce launch delays and long lines. Other recreational uses include sea kayaking and canoeing. According to Jonathan Wright, City Manager of Reedsport, "Each boat, each trailer that you see here - many of them have purchased gas here, purchased materials and have gone to a restaurant or two during their stay here. All those things serve to benefit the local economy." Cost of the project was approximately $2M, which was paid by several partners, including the Oregon State Marine Board, Oregon Department of Fish and Wildlife (ODFW) thru a U.S. Fish and Wildlife Service Sport Fish Restoration grant, ODFW R and E board, Port of Umpqua, Reedsport Winchester Bay Chamber of Commerce, Oregon State Parks, USDA, Reedsport Urban Renewal District and City of Reedsport.